Printed scores in first, early and deluxe editions - Gluck to Gershwin, Verdi to Varese: chamber music, solo and four-hand piano music, full scores, signed scores, operas, early American sheet music, etc. as well as some original 19th and 20th-century manuscripts and a selection of facsimile manuscripts (great for study, great for gifts). Composizione Per Orchestra Nr. 2, Diario Polacco '58. Study Score. Ars Viva Verlag: Mainz, 1959. Narrow Folio (16.5" h x 8" w). 63 pp. Paper boards with cloth spine. Excellent. Cutaway score - a style of score preparation popular in the 1950s and 60s. Amat, Joan Carlos (1572-1642) Guitarra Espanola. Editions Chanterelle: Monte Carlo, 1980. Duodecimo. 56 pp. facsimile + 10-page commentary in English. Wrappers. As new. A facsimile of the 1761 edition of the Castillan method which first appeared c. 1596 and was probably the earliest method showing how to play the five-course guitar in the strummed style. 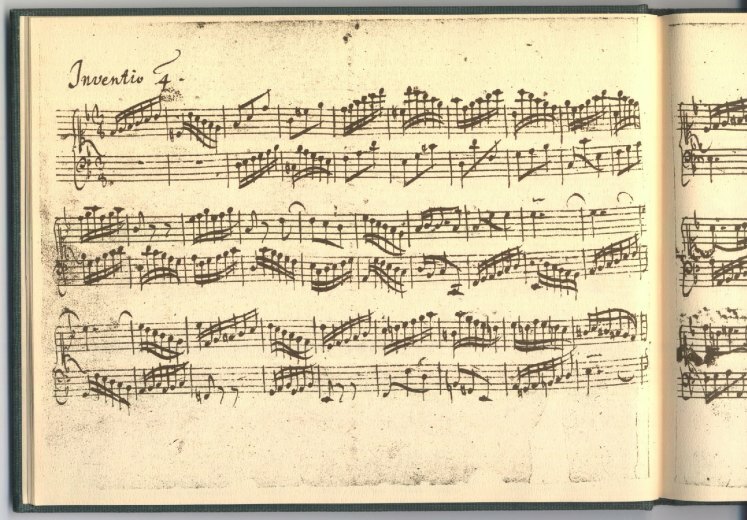 Ariosti, Attilio (1666-1729) Sei Lezioni Per La Viola D'Amore, Ridotte Per Il Violoncello O Per La Viola E Fatto Un Accompagnemente Di Piano-Forte Sull Basso Numerato Da Alfred Piatti. Alfred Piatti. Hill & Sons: London, 1897. Folio. 13 pp. Spine reinforced. Fine. Artok, Leo Junge Tänze: Short Modern Dances [for Piano]. Schott: Mainz, 1928. PN 32182. Large quarto. 16 pp. Tiny chips off top left and bottom right edges of cover, small repaired tear to left bottom edge, otherwise very good and crisp. Ten dances including Shimmy, Tango, Blues, etc. 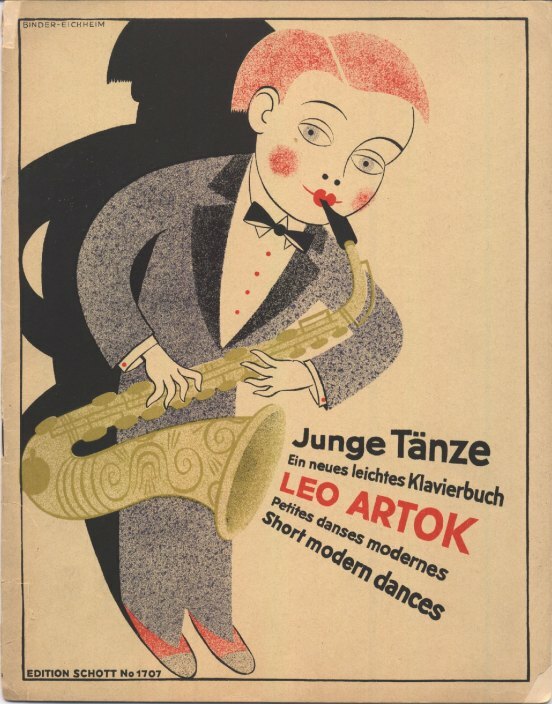 Fabulous art-deco cover - a colored lithograph by the esteemed German team of René Binder and Max Eichheim (Binder/Eichheim Presse), showing a stylized jazz musician playing a saxaphone. Artot, J. (1815-1845) Souvenirs De Bellini. Fantaisie Brillante Pour Le Violon Avec Accompagnt. De Orchestre Ou Quatuor Ou Piano Dédiée à Son Altesse Impériale Et Royale Madame La Grande Duchesse Hélene De Russie...Op: 4. Schott: Mainz, [1839-40]. PN 6170. Folio. 13 7 pp. Disbound. Paper reinforcement along binding and edges of pages, some creases from binding, otherwise, very good. Auber, Daniel (1782-1871) Overture De La Muette De Portici Par Auber Arrangée En Quatuor Pour Flute, Violin, Alto & Basso Par Charles Zulehner. Simrock: Bonn, . PN 2808. Folio. 5 + 3 + 3 + 3 pp. Fine. Auber, Daniel (1782-1871) Overture To The Celebrated Opera Of Gustavus The Third Or The Masked Ball As Performed At The Theatre Royal, Covent Garden [arranged For Piano And Flute]. D'Almaine & Co: London, [after 1834]. PN "Ov: Gustavus the Third". Folio. 11 + 2 pp. Disbound. Separate piano and flute parts. Bach, Carl Philipp Emanuel (1714-1788) Keyboard Sonatas, Wq. 55 (1779), 56 (1780), 57 (1781), "Sechs Clavier-Sonaten Für Kenner Und Liebhaber, Der Madam Zernitz, Geborne Deeling In Warschau, Aus Besonderer Hochachtung Und Freundschaft Gewidmet...Erste [Zweyte, Dritte] Sammlung". By the author: Leipzig, 1779/1780/1791. First Edition. Oblong Folio. 46 32 38 pp. Buckram boards with leather label, some shelf soiling. Some foxing and bleed-through throughout, otherwise very good. Includes list of subscribers for each publication. Bach, Johann Christian Symphonies, Op. 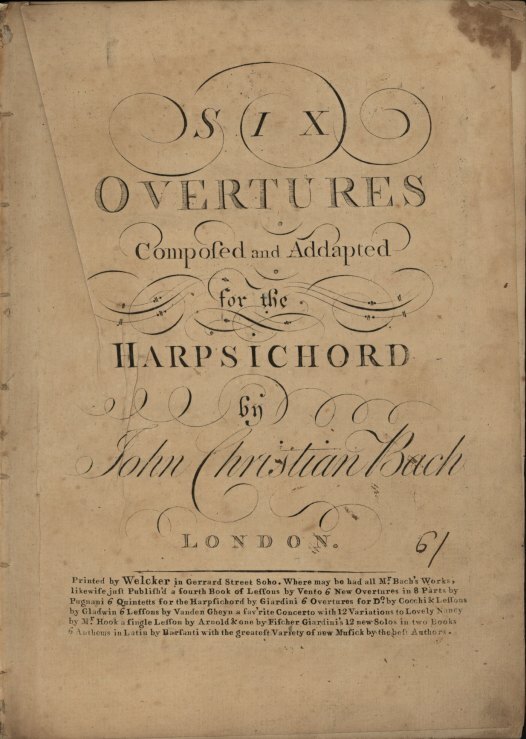 3, Arr., "Six Overtures Composed And Addapted [sic] For The Harpsichord By John Christian Bach". Welcker: London, [c. 1770]. Folio. 25 pp. Disbound. Stain on upper right corner of title page and bleeding through to all pages, minor foxing on some pages, otherwise good. Bach, Johann Sebastian (1685-1750) Clavier-Büchlein For W.F. Bach. Yale University: New Haven. Bound photocopy from Yale Library. Long oblong folio. 154 facsimile pp. Buckram. Fine. This photocopy was made by Yale University, who owns the manuscript, prior to the one they published in 1959. Bach, Johann Sebastian (1685-1750) Inventionen Und Sinfonien. Peters: New York, 1948. Oblong quarto. 61 pp. of facsimile + 1-page forward by Ralph Kirkpatrick. Green buckram boards. Very good. 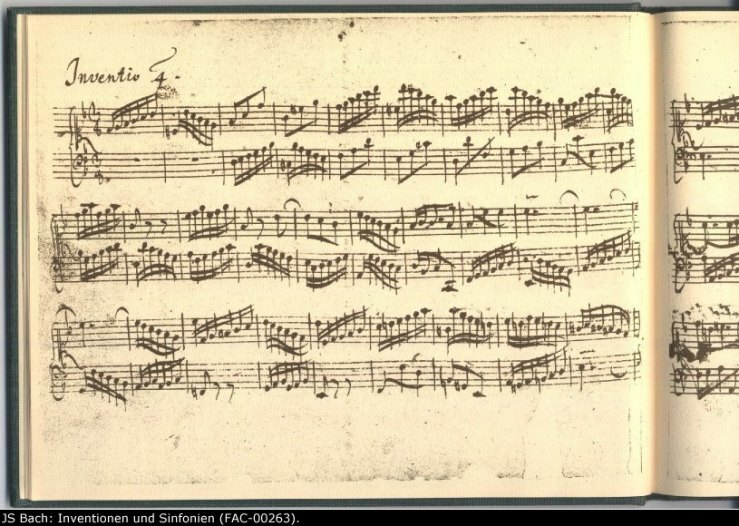 Bach, Johann Sebastian (1685-1750) Inventionen Und Sinfonien. Peters: Leipzig, n.d. Oblong small quarto. 61 pp. of facsimile 1-page commentary by Georg Schuenenman. Vellum-simulated paper wraps. Spine chipped & two very small tears on bottom of cover; otherwise very good. Bach, Johann Sebastian (1685-1750) Keyboard Works: Partitas 1-5, BWV 825-29, Duets, BWV 802-05, "Compositions Pour Le Piano-Forte Sans Et Avec Accompagnement Par Jean Sebastien Bach, Edition Nouvelle...par Charles Czerny...Oeuvres Complets Liv. 5". Bureau de Musique de C.F. Peters: Leipzig, . PN 2636. Folio. 99 pp. Disbound. Light stain on lower left of title page, light foxing throughout, otherwise very good. Title page portrait by Kneisel. Stamped "Biblioteca Landsbergian." Bach, Johann Sebastian (1685-1750) St. Matthew Passion, BWV 244, Piano/Vocal Score, FIRST EDITION, "Grosse Passionsmusik Nach Dem Evangelium Matthaei...Vollständiger Klavierauszug Von Adolph Bernhard Marx. Seiner Königl. Hoheit Dem Kronprinzen Von Preussen...gewidmet Vom Verleger". Schlesinger: Berlin, 1830. PN 1571. First Edition. Oblong folio. 190 pp. Embossed boards with leather spine, shelf wear to edges, inner front hinge loose. Some pencilled annotations, some foxing, otherwise very good. Includes subscription list and 8 pages of text. Bach, Johann Sebastian (1685-1750) Well-Tempered Clavier, Book II, BWV 870-93, "Le Clavecin Bien Tempéré Ou Préludes Et Fugues Dans Tous Le Tons Et Demi-tons Sur Les Modes Majeurs Et Mineurs Par Jean Sebastien Bach, Edition Nouvell...par Charles Czerny. Partie II". Bureau de Musique de C.F. Peters: Leipzig, . PN 2636. Folio. 99 pp. Disbound. Final leaf detached, occasional foxing, otherwise very good. Title page portrait by Kneisel. Stamped "Biblioteca Landsbergiana." A copy of Book I of the same edition with no title page and with pages 1-12 replaced by blank manuscript paper is included. Baron, Ernst Gottlieb (1696-1760) Fantasie Für Die Laute. Breitkopf & Härtel: Leipzig, 1969. Oblong folio. 11 pp. of facsimile + 15-page transcription. Boards. Covers rubbed, otherwise very good. Includes Ferdinand Seidel: Menuetten für die Laute. I.
Bartók, Béla (1881-1945), and Zoltán Kodály Hungarian Folksongs For Song With Piano. Editio Musica Budapest: Budapest, 1970. No. 469. Large folio. 23 facsimile pp. + 12 pp. of commentary in English including a preface by Bartók & Kodály. Brown paper boards. Corners bumped, spine faded, otherwise very good. Includes rough draft of the Felhívás (The Appeal). Bartók, Béla (1881-1945), and Zoltán Kodály Hungarian Folksongs For Voice With Piano. Boosey & Hawkes: London, 1970. No. 9 of an edition of 400. Large folio. 23 facsimile pp. + 12 pp. of commentary in English including a preface by Bartók & Kodály. Beige silk boards with brown d/j. Dust jacket faded, otherwise as new. 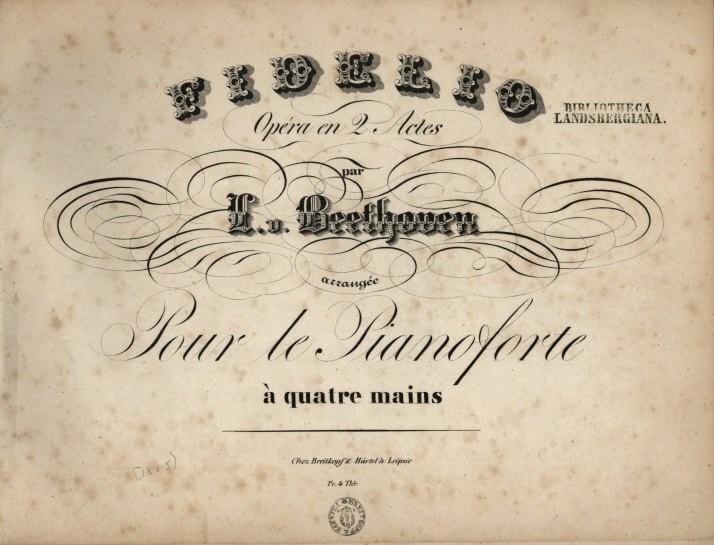 Beethoven, Ludwig van (1770-1827) Fidelio, Op. 72, "Fidelio, Oper In Zwey Aufzügen, Nach Dem Französischen Bearbeitet Von F. Treischke, Clavierauszug." Piano Vocal Score. N. Simrock: Bonn, . PN 1136. Oblong large quarto. 159 pp. Engraved. Original tan marbled boards with title and leather label, rebacked in brown leather. Evenly sunned with occasional light foxing and water stain on far right edge of first 2 pages. An EARLY EDITION, issued less than a year a year after the first edition. Kinsky, p. 184. Hirsch IV. 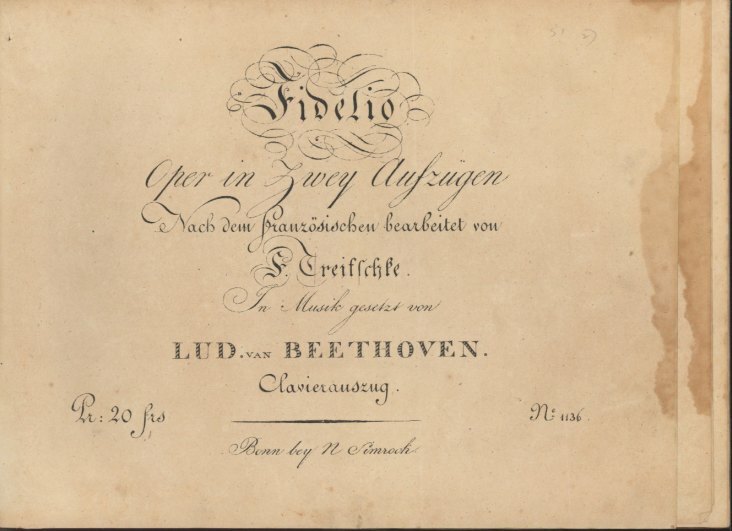 Beethoven, Ludwig van (1770-1827) Fidelio, Op. 72, 3rd Version, Arranged, "Fidelio Opéra En 2. Actes Par L. V. Beethoven Arrangée Pour Le Pianoforte à Quatre Mains". Breitkopf & Härtel: Leipzig, . PN 4818. First Edition in this arrangement. Oblong folio. 101 pp. Disbound, but with original light green paper cover. Some bleedthrough and offprinting, otherwise very good. Title page stamped "Biblioteca Landsbergiana." Arranged by C.F. Ebers (Kinsky). Beethoven, Ludwig van (1770-1827) Fidelio: "Gott, Welch Dunkel Hier In Des Leben Frühlingstagen". VEB Deutscher Verlag: Leipzig, 1976. Oblong folio. 4 facsimile pp. with commentary in German & English. Decorative paper binding. Spine rubbed at bottom, otherwise fine. The third version of Floristan's aria (1814). 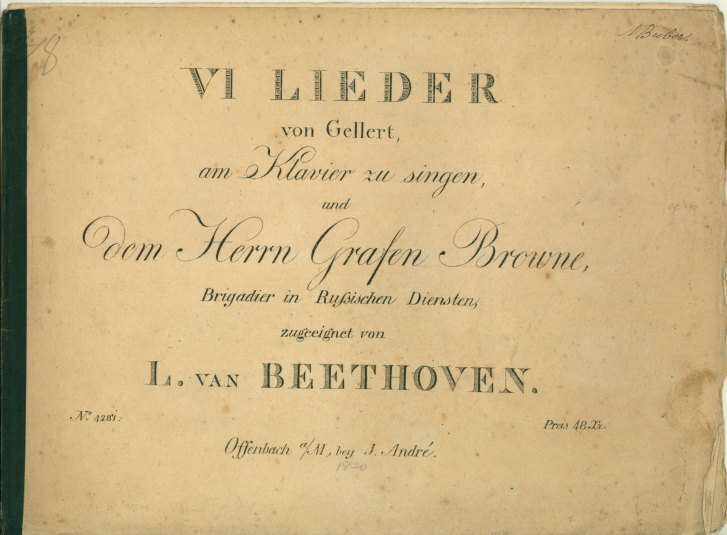 Beethoven, Ludwig van (1770-1827) Lieder, Op. 48, "VI Lieder Von Gellert, Am Klavier Zu Singen, Und Dem Herrn Grafen Browne, Brigadier In Russischen Diensten, Zugeeignet. J. André,". André: Offenbach am Main. PN 4281. Early Edition. Oblong. 11 pp. Taped spine, occasional spotting, but overall a very nice copy. Beethoven, Ludwig van (1770-1827) Overture, Op. 115, "Grosse Ouverture In C Dur Gedichtet Für Grosses Orchester Und Seiner Duchlaucht Dem Fürsten Und Herrn, Anton Heinrich Radzivil Statthalter Im Grossherzogthum Posen Ritter...gewidmet, 115tes". Steiner: Vienna, [c. 1825]. PN S.u.C.No.4681. First Edition, early issue ( Kinsky records the correction of "Staathalter" to "Statthalter" for the full score in later issues but does not specify further). Folio. 4 + 4 + 4 + 3+ 3 + 5 + 3 + 3 + 3 + 3 + 3 + 3 + 3 + 2 + 2 + 4 + 2 pp. In a modern dark green silk folder. Slight browning at edges but overall a fine copy with wide margins. 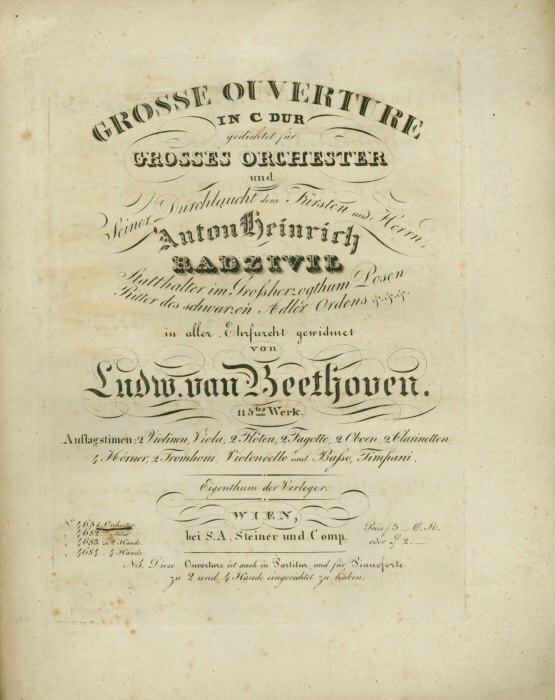 Beethoven, Ludwig van (1770-1827) Overture: Egmont, Incidental Music, Op. 84, Arranged, Marsch Aus Der Musik Zu Goethe's Egmont Von L. Van Beethoven. Op. 84. Arrangement Für Das Pianoforte Zu Vier Händen. Breitkopf & Härtel: Leipzig, [after 1870]. PN 9305. Folio. 5 pp. (all separated). Disbound. Pages loose, minor tear at bottom of title page, some edges chipped, otherwise very good. Plate number dates from 1856, but a catalog on the back cover lists Bargiel's Symphony Op. 30 (1861) and Reinecke's Symphony Op. 79 (1870). Beethoven, Ludwig van (1770-1827) Piano Concerto No. 1, Op. 15, Arranged, Grand Concerto Pour Le Pianoforte Avec Accpt. De L'Orchestre Op. 15, No. 1 Par L. V. Beethoven Arrangé Pour Le Pianoforte à Quatre Mains Et Dédié à Monsieur Le Chevalier Spontini...par J.P. Schmidt. Breitkopf & Härtel: Leipzig, . PN 4867. First Edition in this arrangement. Oblong folio. 63 pp. Disbound. Light to moderate foxing in margins of some pages, a few pages more heavily foxed, otherwise very good. Title page stamped "Biblioteca Landsbergiana." Beethoven, Ludwig van (1770-1827) Piano Concerto No. 2, Op. 19, Arranged, Concerto Pour Le Piano-Forte, Oeuv. 19, Arrangé Pour Le Pianoforte à Quatre Mains Par X. Gleichauf Composé Par Louis Van Beethoven. Bureau de Musique de C.F. Peters: Leipzig, . PN 2522. First Edition in this arrangement. Oblong folio. 41 pp. Disbound. Minor foxing on title page, occasional foxing in margins, a few pages with moderate foxing, otherwise very good.